3 What do mosquitoes eat? The word “mosquito” was derived from Spanish “mosca” (means “fly”) and diminutive “ito” (means “little”). According to mosquito definition, they belong to the family Culicidae, which is the most extensive subfamily and its species are found in every continent (except Antarctica). In fact, they are highly concentrated in tropical regions due to the sufficient natural environment and factors. There are over 3,000 mosquito species, including 108 genera and 11 tribes, worldwide. Over 170 different types of mosquitoes inhabit in the USA. They slightly differ in the way they look: head with tube-like mouthparts, slim body with long legs and wings. The only thing the have in common is that the females of most mosquito species must get protein from a blood meal to oviposit. 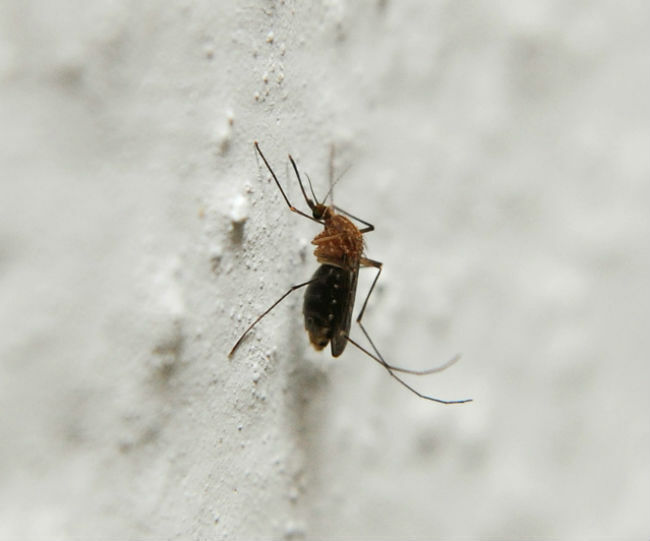 Mosquito males do not bite, their mouthparts are undeveloped and they are not able to pierce the skin. So, they are vegeterians and feed on sap. In fact, mosquitoes are insects with holometabolous life cycle. In order to benefit their larval stage, they oviposit or lay their eggs in stagnant water of lakes, ponds, languid streams and rivers, slues and marshes. According to mosquito definition, they are tiny midge-like flies. Adult mosquitoes are less than 1 inch in length. Their color range is from light gray to black with white striped legs. 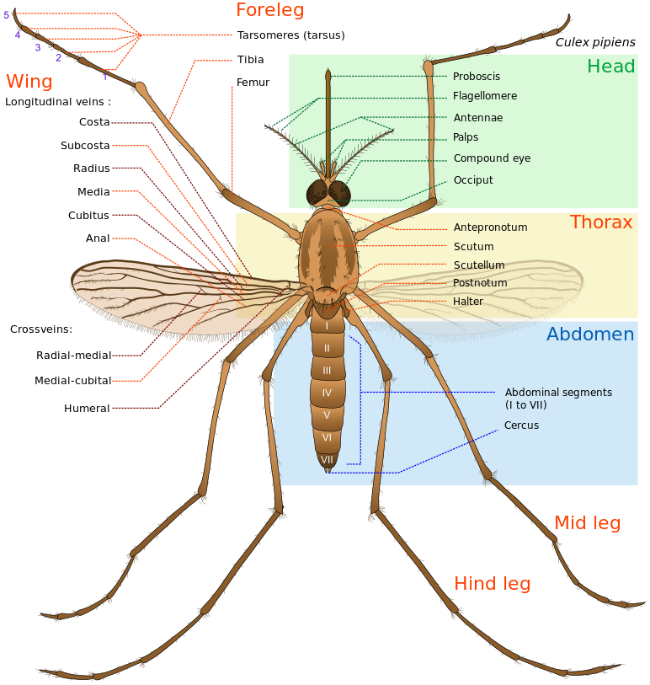 Of course, mosquitoes do not have teeth and when they bite, they “drill” into skin with proboscis-style mouthparts. Immature mosquitoes, also known as mosquito larvae, vary from 0.06 to 0.5 inches in size depending on how old the larva is. Their body is slim and worm like. Moreover, they have noticeable heads. In addition, they are from light gray to brown in color. Mosquito larvae feed on plants, aquatic organisms and microorganisms, that dwell in the water of stagnant basins. They use brush-style and grinding mouthparts for feeding. Some species are predatory and have additional mouthparts for grasping. Mosquito pupae don’t eat anything, they only intake air on the surface of water. If one says that male mosquitoes bite and pierce into skin to consume their blood, it is not true. Only mosquito adult females are able to feed on the blood of vertebrates before they lay eggs. What are mosquitoes attracted to? When females seek for food, they use their eyes to see a host and sensors to detect changes in light waves and odors. Moreover, mosquitoes of both sexes consume sap (plant fluids) and nectar (plant sugars). A multivoltine female mosquito oviposit in calm, standing water in natural and artificial reservoirs of fresh water or salt water, namely ponds, lakes, gutters, small puddles in yards, planters, buckets, and the like. All Psorophora and some Aedes mosquito species lay eggs on ground and when flooded, water helps them hatch. Furthermore, some mosquito species use excavations in plants for oviposition. Mosquitoes in immature stages, such as egg, larval, and pupal stages, are aquatic and live on the surface of water, at the bottom or under water.